Hybrid Cars Save Money | Bumblebee Batteries can save you money! If you’ve had extra money in your pocket this summer, it’s because the United States is experiencing a lull in gas price increases in 2015. Even so, the cost of filling up at the pump will only continue to rise this century as fossil fuel supplies dwindle worldwide. Because of that, hybrid vehicles are fast becoming the norm on roads all over the world. In fact, more than 4.5 million hybrid cars were sold in 2012 alone, including about 2.18 million in the United States. Will a hybrid car really save me money over time? Short answer — definitely. 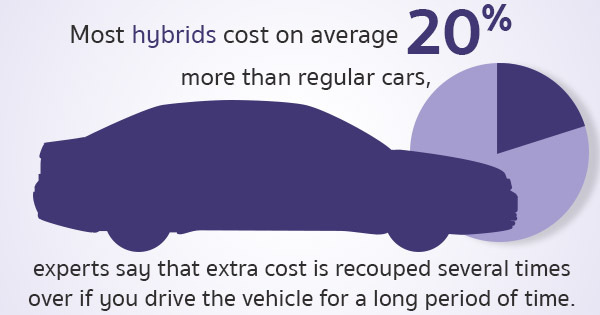 Although most hybrids cost on average 20% more than regular cars, experts say that extra cost is recouped several times over if you drive the vehicle for a long period of time. That’s because hybrids really do save you money at the pump. Energy from braking is used to partially recharge the batteries in hybrid cars, which in turn powers the engine without burning through your gasoline tank. Fun Fact: the most fuel efficient hybrid vehicle on the road (the 2000 Insight) had a highway rating of 61 miles per gallon, and a city/highway rating of 53 mpg, according to the Environmental Protection Agency. Claim: the cost of replacing hybrid battery cancels out fuel savings. Wrong. It is true that a hybrid car battery can cost from $3,000 to $4,000 in the United States. However, tax incentives can also save hybrid car drivers up to $3,400, offsetting the cost of replacing hybrid battery every six to eight years. Plus, most hybrid batteries come with an eight year and 100,000 mile warranty. Do hybrids really help the environment? Not everyone purchases a hybrid car to save money. Hybrids are 20 to 35% more fuel efficient than your typical gas guzzling car. That means harmful greenhouse gas emissions from hybrids are also reduced by up to 35%.